According to a recent PBS report based on information from the Organization for Economic Co-operation and Development (OECD), the United States spends greater than two-and-a-half times the amount that any of the most developed nations around the globe spend on health care and one-and-one-half times as much as the next-highest-spending nation (Netherlands). Depending on which report you read, our health care expenditures account for between 17.6% and 17.9% of our nation's gross domestic product (GDP). In contrast to our health care expenditures, the Commonwealth Fund's 2011 comprehensive assessments of U.S. population health and health care quality, access, efficiency, and equity show the United States scoring 64, with benchmark performance at 100, across 42 performance indicators. In 2010, one-third of U.S. adults did not get medical care, did not fill a prescription, or skipped a needed test or treatment because of cost. In Great Britain, the comparison number was 5% of adults. For sicker adults experiencing medical, medication, or lab test errors, the U.S. rate was twice as high as the benchmark of the eight best countries. For potential overuse or waste in the medical system, the U.S. score was 40, relative to a benchmark of 100. If health care costs continue to grow at historical rates, they would account for 34% of GDP by 2040. Slowing the annual growth rate of health care costs by 1.5 percentage points would increase GDP by over 2% in 2020 and nearly 8% in 2030.The beneficial impact on employment is estimated at 500,000 jobs each year the effect is felt. The Centers for Disease Control and Prevention (CDC) estimate that at least 1.7 million health care treatment-related infections occur each year and lead to 99,000 deaths. Adverse medication events cause more than 770,000 injuries and deaths each year. The cost of treating patients who are impacted by these events is estimated to be as high as $5 billion annually. A study to implement CDC recommendations to reduce central-line-associated blood stream infections was conducted in 100 intensive care units (ICUs). The study reduced the rate of such infections by two-thirds within three months. Over 18 months, it saved more than 1,500 lives and nearly $200 million in just 100 ICUs. Baldrige hospitals (award winners and those that have received a site visit) demonstrate faster five-year performance improvement than their peers. Baldrige hospitals, as a group, are about 83 percent more likely than non-Baldrige hospitals to be awarded Thomson Reuters 100 Top Hospitals® national recognition for excellence in organization-wide performance. Baldrige hospitals have outperformed non-Baldrige hospitals on six of seven individual measures of performance used in the 100 Top Hospitals composite score, including the Centers for Medicare and Medicaid Services' (CMS) Core Measures and adjusted operating profit margin. Overall, the 100 Top Hospitals winners have extensively adopted Baldrige practices, even though 63 percent reported they did not intentionally use the Baldrige Criteria to develop organizational goals and/or process improvement initiatives. Teaching hospitals reported the highest formal use of the Baldrige Criteria. Nearly 70 percent of these hospitals noted that their teams have used the Criteria to develop organizational goals and process improvement initiatives. One of the major challenges facing the majority of CEOs surveyed is organization-wide alignment (the ability of all parts of an organization to work together to support key goals, address key challenges, and respond to sudden changes) as they prepare their hospitals for health care reform. More than 80 percent of the respondents agreed or strongly agreed that they have implemented the Baldrige practices listed on the survey, with the exception of alignment of results across all areas (68 percent). 65% of hospitals are likely to "use the Baldrige Criteria for Performance Excellence as a systematic framework for performance improvement or as an internal assessment tool" by 2018. 41% are likely to submit an application for the Baldrige Award or a state-level Baldrige-based award by 2018. 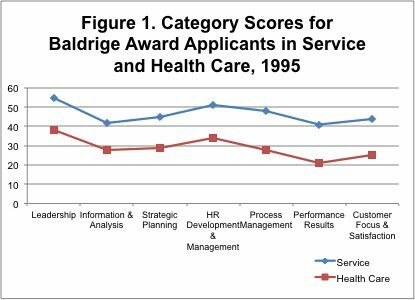 In 1995 when the Baldrige Criteria were being piloted in health care, there was a significant discrepancy between the performance of health care organizations using Baldrige and leading-edge for-profit service companies applying for the Baldrige Award. 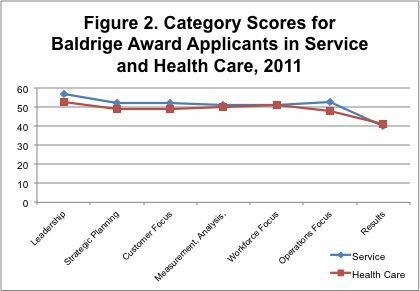 This difference is demonstrated by Baldrige award applicant scoring profiles, as shown in Figure 1. The weight of evidence in the studies described above and these Baldrige scoring data, I believe, validate several Baldrige premises. First, that a similar set of criteria can guide improvement and recognize excellence across industry and nonprofit sectors. Second, that best-practice sharing can be beneficial across sectors. Finally, and most important, that wide adoption of the Baldrige Criteria by health care organizations can improve U.S. health care quality, reduce costs, benefit all of us, and finally impact competitiveness and GDP. For more information and data on the use of Baldrige in health care, please read some of our available resources. Now that you have the evidence, please join us in spreading the word about the benefits of Baldrige in improving health care quality, reducing costs, and improving U.S. competitiveness as an outcome.